Doug Suttles, CEO of Encana Corp., speaks to reporters in Calgary in 2013. Prices for both Western Canada Select, an oil sands bitumen blend, and Edmonton Sweet crude oil, fell relative to New York-traded West Texas Intermediate because of a lack of pipeline capacity, growing production from the oil sands and a reduction in demand due to U.S. refinery maintenance shutdowns, said Tim Pickering, founder of price tracker Auspice Capital in Calgary. “It’s proportionate to the cash flow. So if (a drilling customer) expected a netback of $50 Canadian or $55 or $60 and they’re only getting $45 or $50, they’ll adjust back to that outlook quickly, within the quarter,” he said. He said the drilling industry in Canada is headed for revenue this year in line with 2017, which was the second-worst year for drilling profitability after a disastrous 2016. 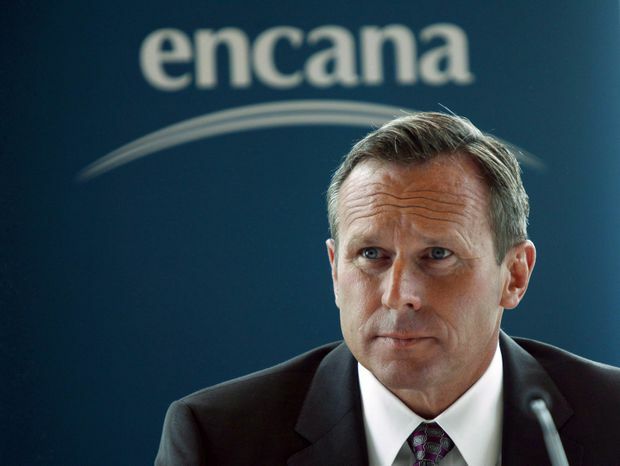 Calgary-based Encana is focused on four major oil and gas plays, the Montney and Duvernay in Western Canada and the Eagle Ford and Permian in the southern United States. Suttles said Encana gets no credit for the clean-burning natural gas it produces, nor for the three B.C. gas plants it built that are powered by hydro electricity. He added it also won’t get credit if the gas is shipped in future to a hydro electricity-powered liquefied natural gas export terminal on the West Coast and on to Asia, where it may replace coal in producing electricity and cutting global emissions. He said the solution is to stop making the situation worse – citing Ottawa’s Bill C-69 to reform the National Energy Board and its proposed clean fuel standards as examples of that – and start coming up with ways to help Canadian companies compete with U.S. rivals.